Rewatch Reread Relisten is an ongoing series in which I revisit specific works that have had a meaningful impact on me as a person and as an artist. For this edition of Rewatch Reread Relisten, I reread X-Wing: Rogue Squadron by Michael A. Stackpole. 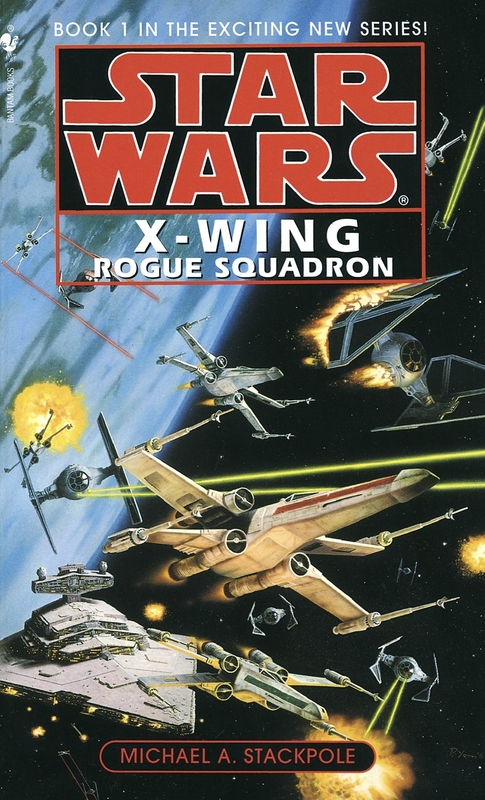 Originally published in 1996, X-Wing: Rogue Squadron is the first novel in the ten book X-Wing series. The series begins about two years after the events of Return of the Jedi and chronicles the exploits of the newly reformed Rogue Squadron. I first read X-Wing: Rogue Squadron in seventh grade, after coming across the series while hunting through the Sci-Fi/Fantasy section of our local used bookstore. I remember it really well because discovering this series one of the few bright spots in a hard year. My older brother, Roger, died in September of my sixth grade year and I was home schooled the second semester of sixth grade. When I came back to school in seventh grade I felt like I no longer knew how to interact with my classmates so I turned to reading. I figured I would rather be the weird kid who didn’t talk to people and read all the time rather than the weird kid who didn’t talk to people and just, like, stared at the wall or something. I would get to school early and read until the bell sounded. When class ended, I would rush to my next class in order to cram in as much reading time into the passing period as possible. I would read through roll call and during second hour I got to read through announcements as well. I have such incredibly vivid memories of reading books from the X-Wing series in my second hour science class that even just picking up the books transports me back to Childers Middle School. I’m so thankful I came across these books when I did because they gave me a world to immerse myself in when my real world was falling apart. Because I have such a strong emotional association with these books, I was honestly kind of scared to revisit them. I know it wouldn’t invalidate my memories and what these books did for me, but it would be a huge bummer if I the books that played such a pivotal roll in my grieving process actually sucked. Luckily, I’m happy to report that is not the case! I think the highest praise I can say about the book is that when I was fifty pages in, I tweeted that reading the book made me want to write Star Wars fan fiction again. (Full disclosure, I did write a short fan fiction scene after finishing the book and it was so much fun to write). For the most part, the writing is not necessarily amazing (in that the focus is more on storytelling than flowery language) but it is also not bad like I feared it might be. I read so many books in middle school that I think I lost my barometer for good prose. I’ve reread things from back then that are absolutely terrible. This book however is a great example of what Brandon Sanderson refers to as “window pane prose”. Meaning prose you can see through that doesn’t draw attention to itself. What is amazing to me is how Michael A. Stackpole writes the dogfights and space battles. The action is so detailed but also so clear that it’s easy to understand what is happening. It makes you really get what it means to be an X-Wing pilot in the Star Wars universe. What I love so much about the X-Wing series versus the rest of the Expanded Universe books I read is that these books are military sci-fi in a space opera universe. It makes for really interesting storytelling because we know The Force exists and could solve so many of the characters problems with a literal wave of the hand, but at this point Luke is the only Jedi in the universe and he’s not around. The technical writing of the space battles is spectacular and adds so much depth to the Star Wars universe. After reading these books it always kind of frustrated me to watch the movies and not see the intricacies of space warfare represented. One of my favorite things about The Last Jedi was that a big part of its plot centered around the shield life of the ships and managing shield life along with speed. That felt like something that could have been ripped straight from the X-Wing series and it made my little nerd heart so happy. There were two big things that stuck out to me from a story perspective. One is that Wedge Antilles is only twenty-seven years old when this takes place. I mean, it makes sense that the rebellion is a young man’s game but still. It’s crazy that I’m older than Wedge. The other thing that stuck out to me was the burgeoning love story between Corran Horn and Mirax Terrick. I had somehow managed to completely forget about that storyline but when Mirax first showed up it started coming back to me. I don’t remember too many specifics but I remember really enjoying their relationship so I’m excited about rediscovering that in the next few books. Honestly, I’m just super excited to reread the rest of the series and I, Jedi, the Corran Horn standalone novel. Of all the realizations I had while reading this book, the biggest was the fact I am much more of an X-Wing fan than a Star Wars fan. I love Star Wars movies, I do, but this series is my favorite thing about Star Wars. It for sure has the most personal meaning to me. I thought I had made peace with the new movies wrecking the Star Wars canon and pushing everything in the Expanded Universe into the Legends Universe, but reading this book was like picking off a scab. My love came back so strong that it breaks my heart a little that these characters aren’t canon. It would have meant so much to me to see them adapted to the screen. In the end though, I understand why Disney had to start fresh for the new movies. The Expanded Universe was incredibly complicated and it would have been ridiculous to expect casual viewers to catch up on thirty years of books/comics/video games/etc in order to understand what was happening onscreen. The big plus to the retconning of Star Wars is that because the continuity is so much more streamlined, I feel like my longstanding desire to write a Star Wars book actually potential to happen. Overall, I really enjoyed my reread of X-Wing: Rogue Squadron. I love how the story plays out and how so much of it relies on the technical aspects of space warfare rather than the mystical aspects of The Force. I’ve been saying it for years, but gravity wells and hyperspace calculations are just as cool as lightsabers and Force lightning. Now if you’ll excuse me, I need to go buy a joystick and download the X-Wing games on Steam.